beautiful blue eyes but sadly, her physical health was not very good. Saint Pierre-de-Montsort to be baptized by Father Lebouc. Mrs.
given the honor of being Léonie's godfather. Hélène who passed away on February 22, 1870, at the age of five. was short from August 16, 1870 to October 8, 1870. From the start of Léonie’s life her physical health was very poor. Dosithée, who was a Visitation nun at a convent in Le Mans. the Visitation boarding school and finally become a student. students as she was not able to focus all of her energy on her work. as a nun in the Visitation convent. and also teaching her the Catechism for her First Holy Communion. Communion, she went to Lisieux to spend some time with her uncle and aunt. from being a pleasant child to being an unruly child. Azélie would bring Léonie with her to Le Mans when she went to see her sister, Sister Marie-Dosithée. her behavior. Sister Marie-Dosithée still held onto the fact that Léonie would someday become religious. 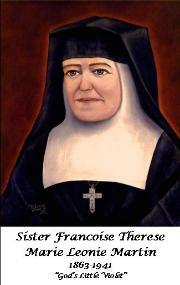 February 24, 1877, Sister Marie-Dosithée ended her suffering with tuberculosis and was received by the Lord. her mother. She noticed that Louise had gained total control over Léonie and was terrorizing and beating her. everything about transforming her life for the better. side all the way to the end. in Alençon to Le Mans. They quickly stopped to pick up Marie and Pauline at the Visitation boarding school. All four of them boarded the train destined to Lourdes. received. Azélie approached Louis with great optimism and said God did answer one of her prayers instead. the cathedral and she was buried in Cimetière Notre Dame (Our Lady's Cemetery). to Azélie, at the cemetery, before setting off for their new home. that she was having when she was at the Visitation boarding school in Le Mans. lady. Louis commonly referred to her as his “Good Léonie”. Benedictine boarding school to visit her former teachers who nicknamed her “The Abbey Lover". monastery in Lisieux, in October 1882. Léonie and her sisters went to visit Pauline often at the monastery. cured when she saw a major change in her physical appearance. make small sacrifices for everyone around them and were not afraid to show their love to strangers in need. youngest sisters Céline and Thérèse her dolls and their clothes. becoming Thérèse’s sponsor. It was a wonderful day for both of them. and that God would find a place for her. in the city of Caen at Monastère de la Visitation (Visitation Monastery). 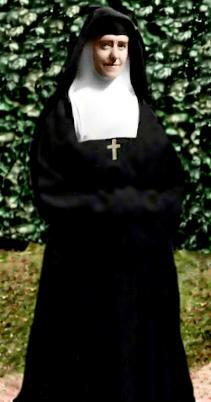 same year on April 9th, Léonie’s youngest sister Thérèse entered the Carmelite monastery in Lisieux. ones there and barely escaped. Their roof had caught on fire but luckily the firemen were able to put it out. of minor strokes and also he started to wander off. One day, Louis had wandered off to a town called La Havre. was very worried that he would wander off again. times very difficult on both of them. becoming a nun at the Visitation. monastery where Marie, Pauline and Thérèse were living as nuns. 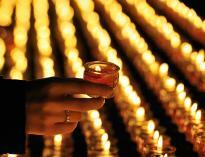 for intercession to be reunited with her sisters at the Visitation monastery in Caen. During the course of three years while Louis was staying at Bon-Sauveur in Caen, he suffered another stroke. were made and a small ceremony took place when Azélie and the rest of the family were buried next to Louis. lived in Caen. These visits by Céline were to be her last to Léonie. Céline, too, sought out the religious life. On September 14th, she entered the Carmelite monastery in Lisieux. novices. As a result of this postponement, Léonie was seeking a transfer to the Visitation convent in Le Mans. to the rule of the Visitation, Léonie, as well as some of her other sisters at the monastery were asked to leave. back with open arms into their home. The relationship between Léonie and her aunt and uncle were very close. Thérèse continued to counsel Léonie to the way of perfection even though she was no longer at the monastery. over the thought of losing their beloved sister. Léonie looked upon Thérèse’s disease, as the divine will of God. So she prepared herself for the impending loss of her sister. went to heaven, to plead her case for her to the dear Lord to lead her on the path of becoming a great saint.